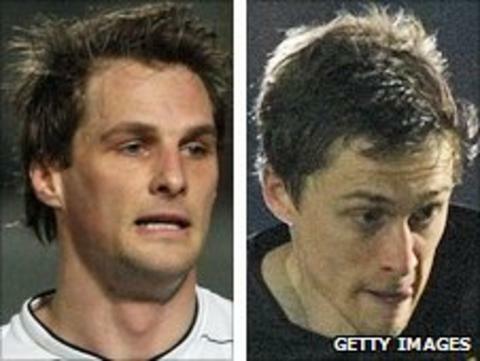 Hereford and Torquay have both been docked points and fined by the Football League for fielding unregistered players in their match on 1 February. Hereford have been deducted three points for playing Rob Purdie in the game at Plainmoor, which they won 3-1. Torquay will lose one point for fielding Jake Robinson. Both clubs missed the 1200 GMT deadline for player registration on the day before the match, an error which led to the deduction and £10,000 fine. Torquay stay seventh in League Two despite the deduction, while Hereford slip to 21st, only five points above the relegation places. The Football League punishment dictates that both clubs must pay 25% of their fine within seven days, with the remaining balance cleared by the end the next season. Hereford chairman David Keyte told BBC Hereford & Worcester: "Two clubs offended in exactly the same way for the same match and our expectation was that the penalty would be the same. "We have left the hearing to discover that Torquay have been penalised just one point to our three with an identical fine so that has left us a little bit bemused and disappointed. "As they say, you are either pregnant or you are not pregnant and the deadline was 12 o'clock. "Our paperwork was with the Football League by 1430GMT while Torquay's player wasn't registered until 10 o'clock at night. "So whichever angle you go at we have a slightly stronger case than Torquay, or so we thought, and yet we are walking away with three times the penalty." Torquay director Bill Phillips was similarly disappointed, adding: "We have 28 days to appeal, so there is time to consider our options." Purdie, 28, signed for Hereford on 31 January until the end of the season following his release by Oldham. Robinson, 24, also arrived at his new club on transfer deadline day, moving to Plainmoor from parent club Shrewsbury on a loan deal until the end of the campaign.